Man, I love this car. 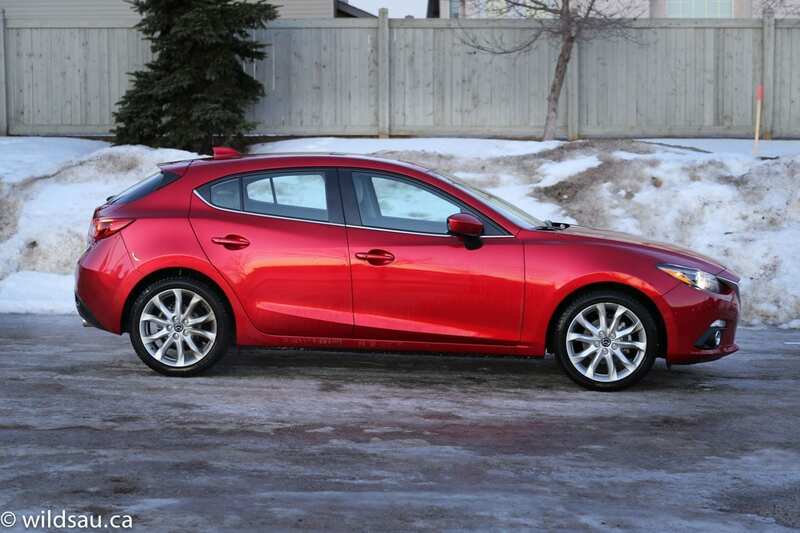 In my books, the Mazda3 Sport is simply one of the best vehicles on the market. 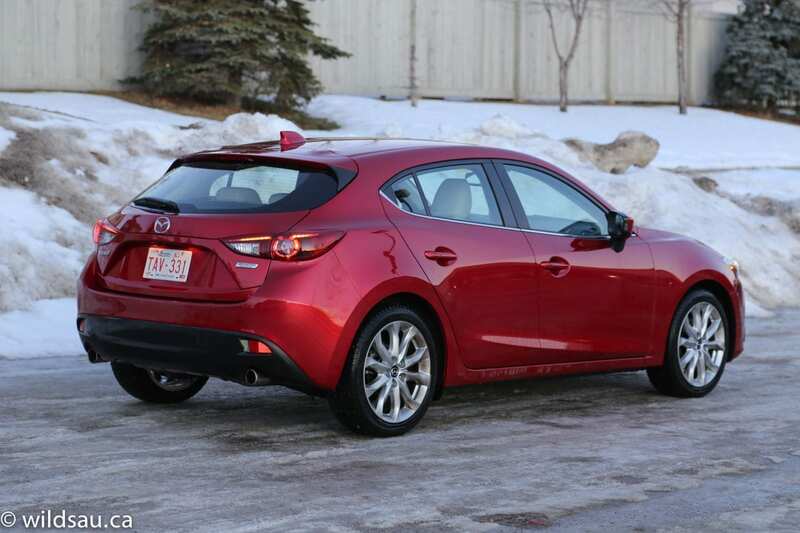 The current generation of Mazda3 gets a style all its own. The long hood and tall rear end give it miniature shooting brake proportions if you are willing to use your imagination. In the end, it’s a very compact wagon-type hatchback. 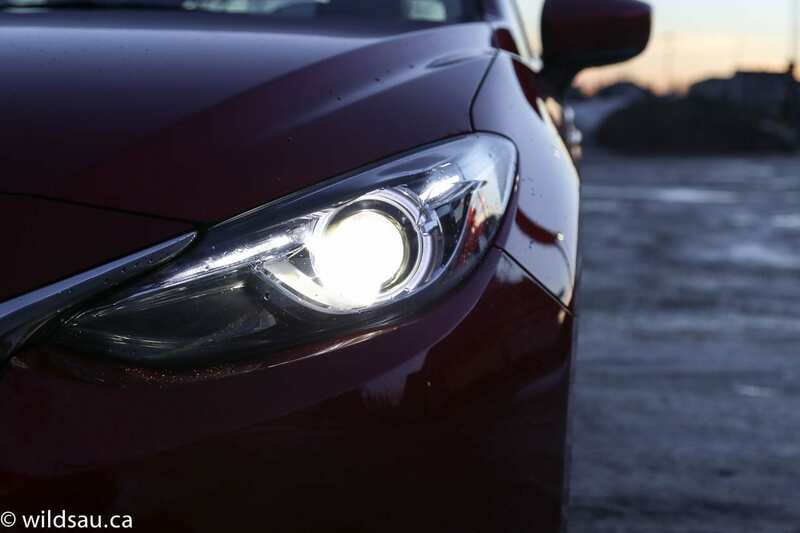 The front end’s combination of grille, bi-xenon HID headlights and LED signature driving lights works to great effect. It still looks happy but not with a goofy grin like the last generation did, and it gets a slight air of aggression. Much of the body is sculpted which gives it muscular lines and character – and beauty, in my opinion. 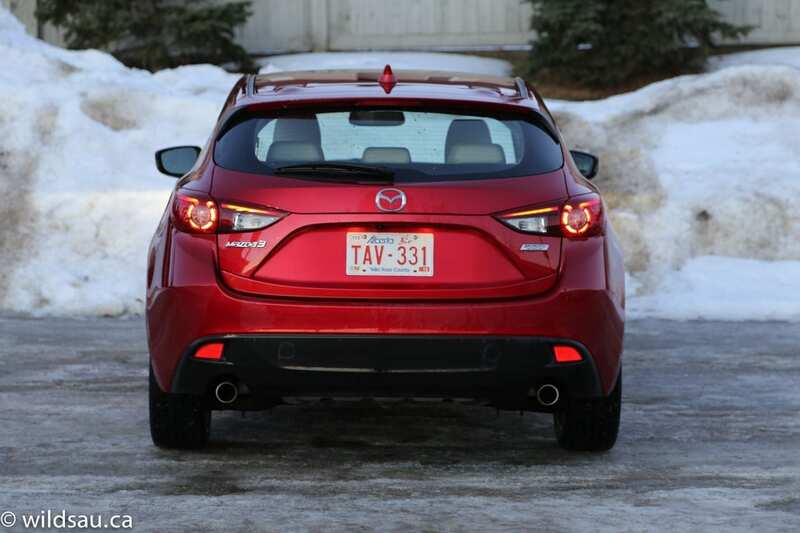 The rear flanks get nifty LED tail lights and there are a couple of exhaust tips to let you know it means business. 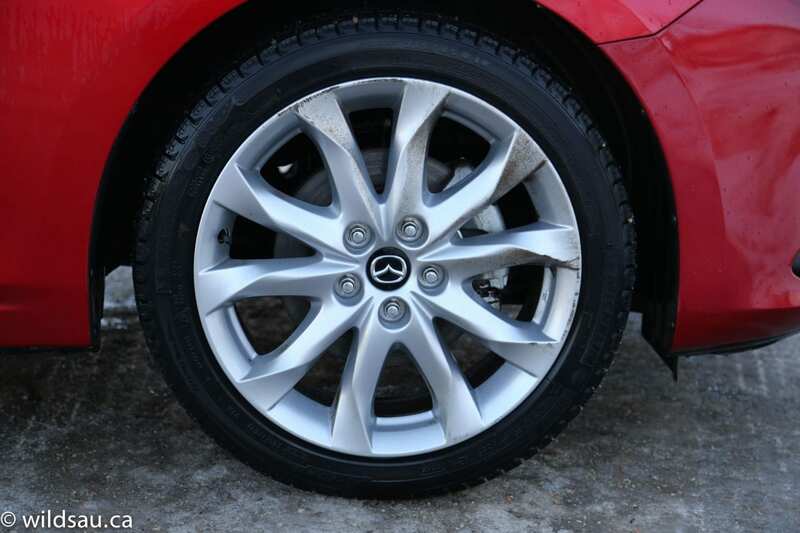 The fenders are filled with very nice 18-inch rims wearing 215/45-sized tires. 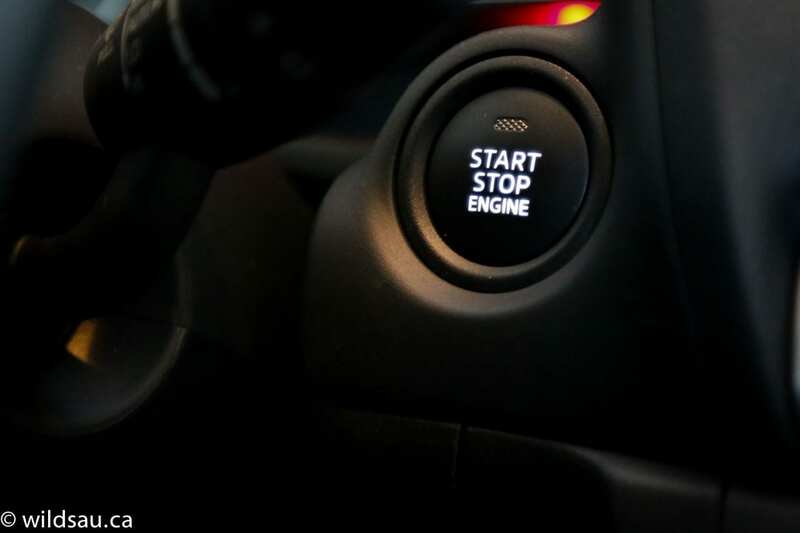 This upscale GT has a keyless entry system, and push-start ignition. The materials are nice, and you’ll find soft-touch surfaces nearly everywhere. I liked the dash’s styling – it’s clean and functional. 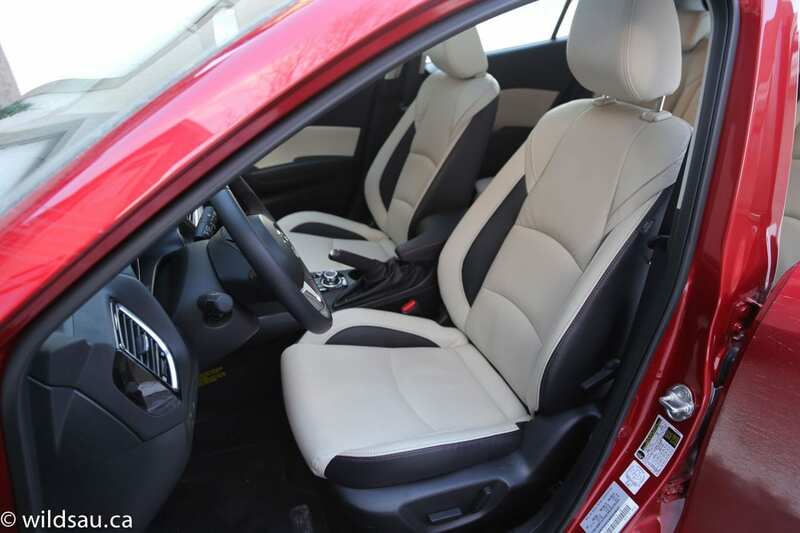 The gorgeous two-tone leather seats (driver’s side is power-adjustable) are heated and very comfortable, and they offer outstanding bolstering for sporty driving. Instrumentation is kept simple and it works well: a large central tach, with a small integrated digital speedometer, as well as a driver information screen. 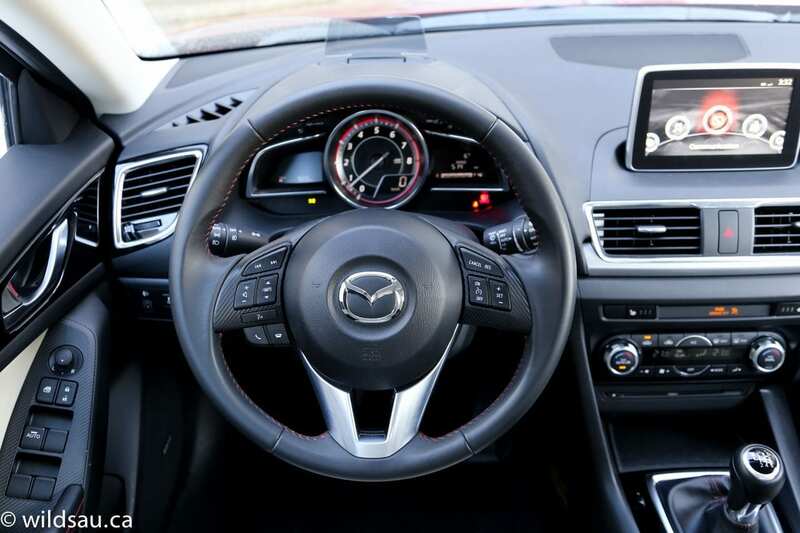 Mazda’s 7-inch touchscreen (audio, phone, navigation) floats above the dash, and I found it a stretch so I preferred to control it with the HMI Commander, a rotary joystick knob. 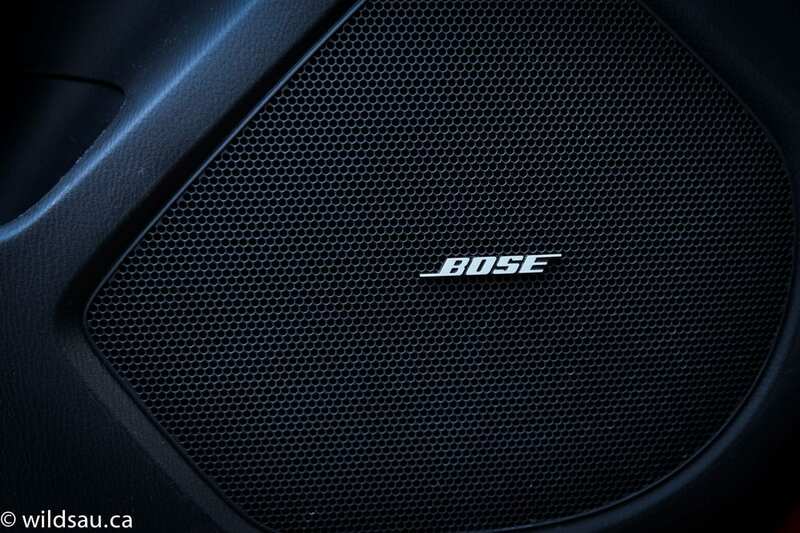 I thought the system’s innovative user interface was easy to understand and use, and the 9-speaker BOSE system sounds good. 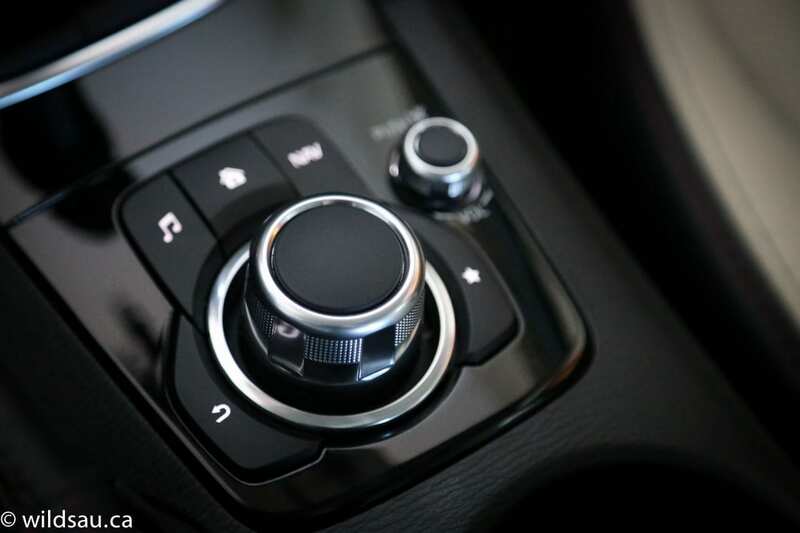 Comfort is handled by a dual-zone automatic climate control system and a tilt/slide sunroof overhead. 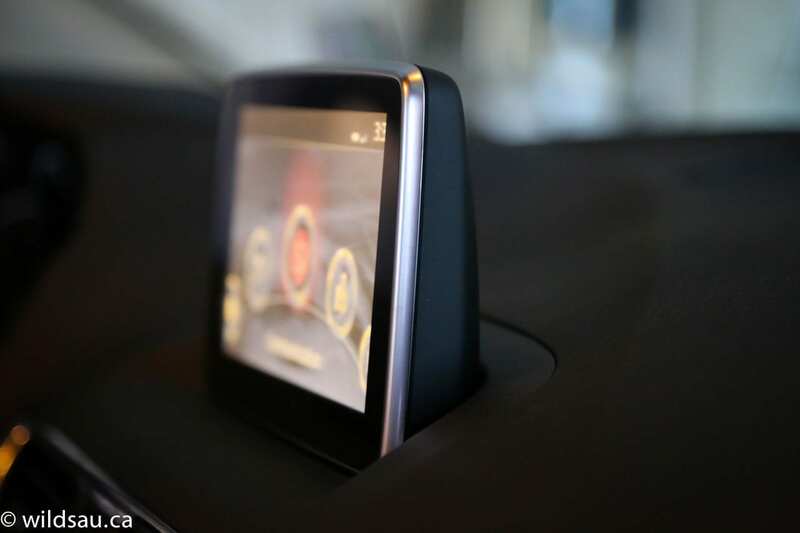 The Mazda’s driver assistance tech comes in the form of a slick heads-up display (which uses a curved lens that pivots up out of the dash) and a rearview camera. I was surprised at the roominess of the back seats for a car in this category. I had head room to spare, and both leg and foot room was acceptable for me (I’m 5’10”). 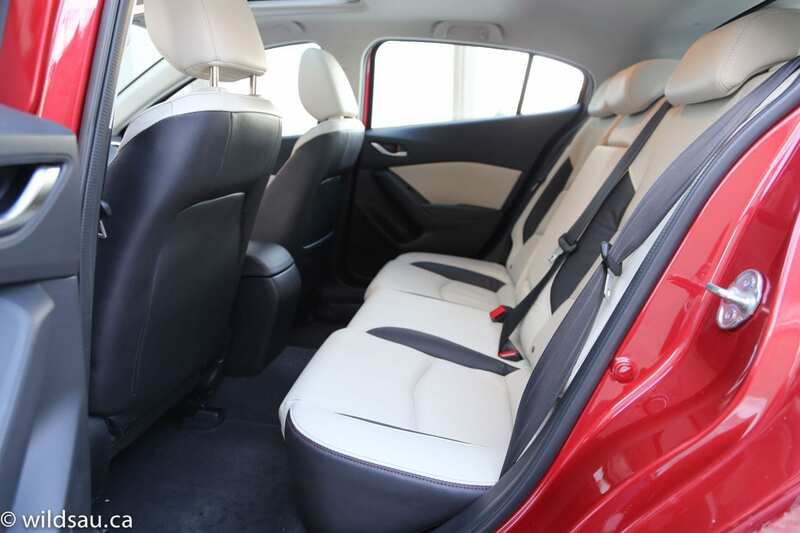 The middle seating position is a bit of a write-off, with its narrow seat and large floor tunnel. While our three kids did fit in the back, none of them volunteered to sit in the middle, so it’s cramped even for kids when it comes to the rear seat width. There are two sets of LATCH anchors for kids’ seats if you need them. 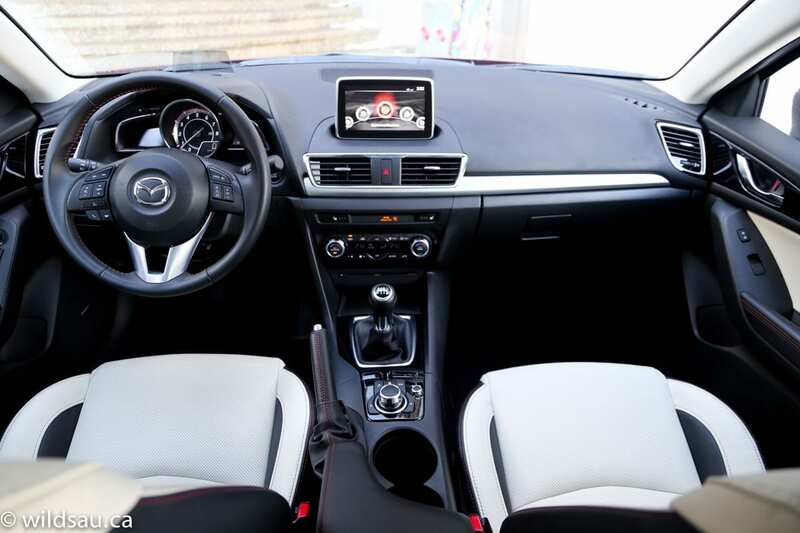 The Mazda3 does a good job at offering nooks and crannies for you to put your stuff. And the car’s trunk is surprisingly large at 572 litres. 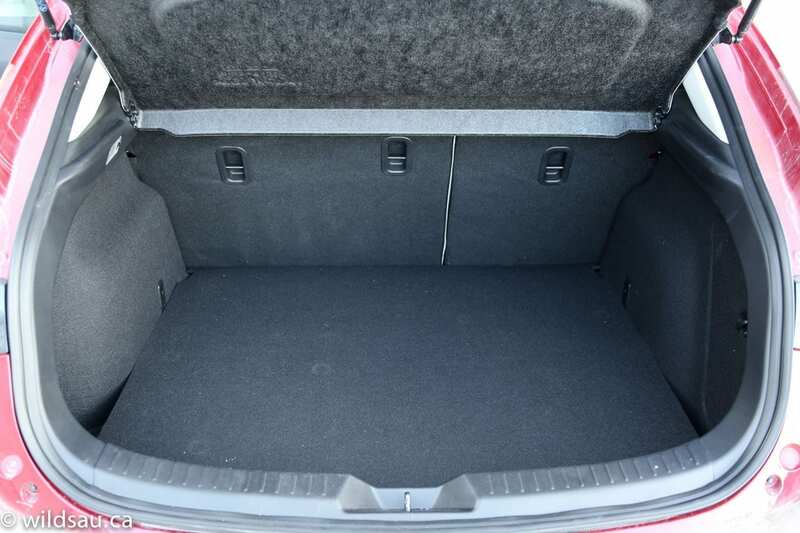 Fold the rear seats down (they split 60/40) and that grows to a very big 1334 litres. 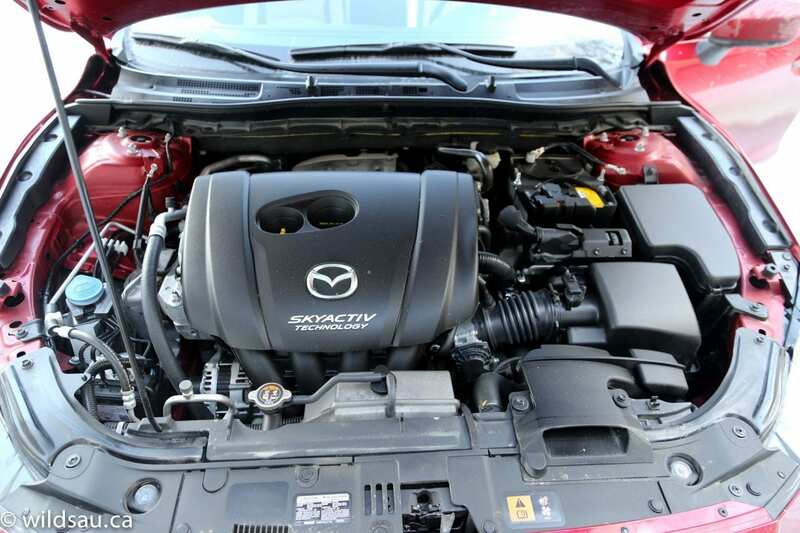 Here you’ll find a 2.5-litre 4-cylinder springing from the loins of Mazda’s nebulous SKYACTIV concept. It’s all a bit hazy, but in the end, it’s easy to understand that it’s really about maximizing efficiency without losing out on performance. The engine is rated at 184 horsepower at 5700 RPM and 185 lb.ft of torque at 3250 RPM. I love that Mazda still offers manual transmissions on so many of their vehicles, and that they do them right. This one has a 6-speed manual, and it drives the front wheels. The car is rated at 9.2 L/100 km (26 US mpg) in the city and 6.6 L/100 km (36 US mpg) on the highway. 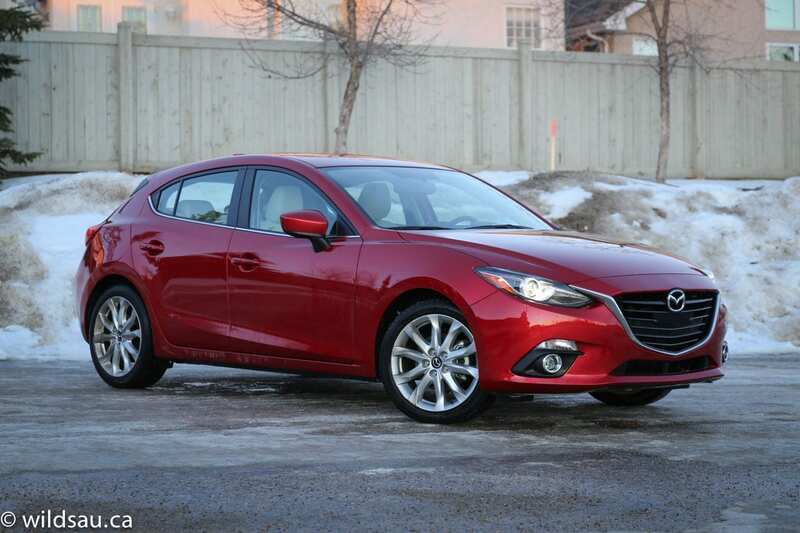 I averaged 9.5 L/100 km (25 US mpg) during my week with the Mazda, driving through fresh snow and frigid temperatures, as well as driving with a heavier-than-usual foot. 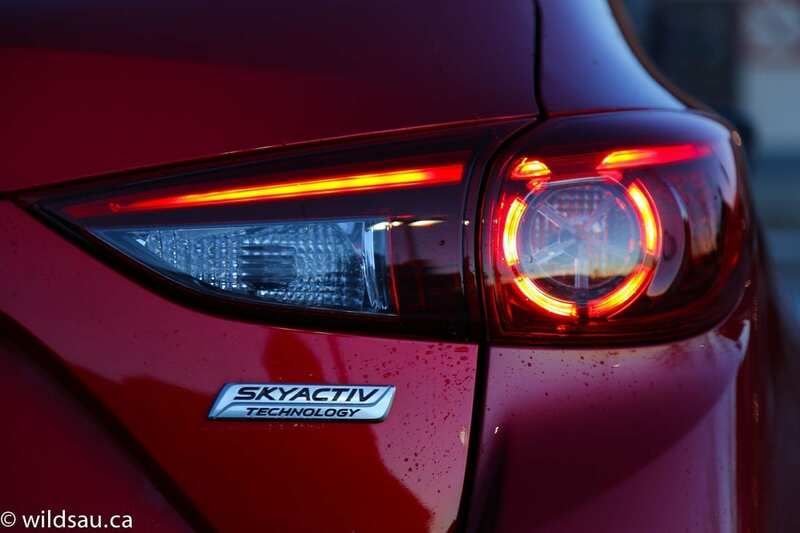 This is the Mazda3’s strong suit. 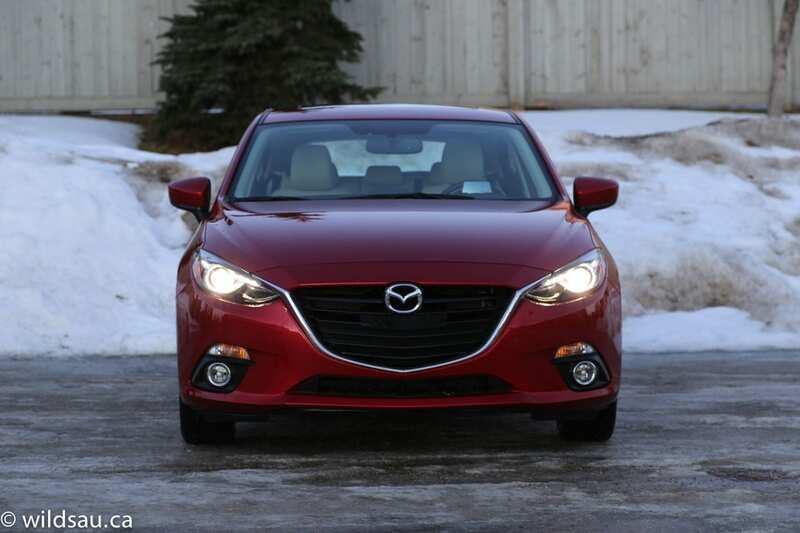 Yes, other cars in this category are spacious inside and get decent fuel economy and don’t get out of whack with their pricing, but the Mazda3 throws in something special. And that’s the fun factor. It’s always been a driver’s car, and the newest generation is no different. The engine is enough to motivate the heavier-than-expected 3000 pound (1361 kg) car off the line, and although it’ll never kick you in the pants, that’s not the point. It is quick enough in every driving situation. 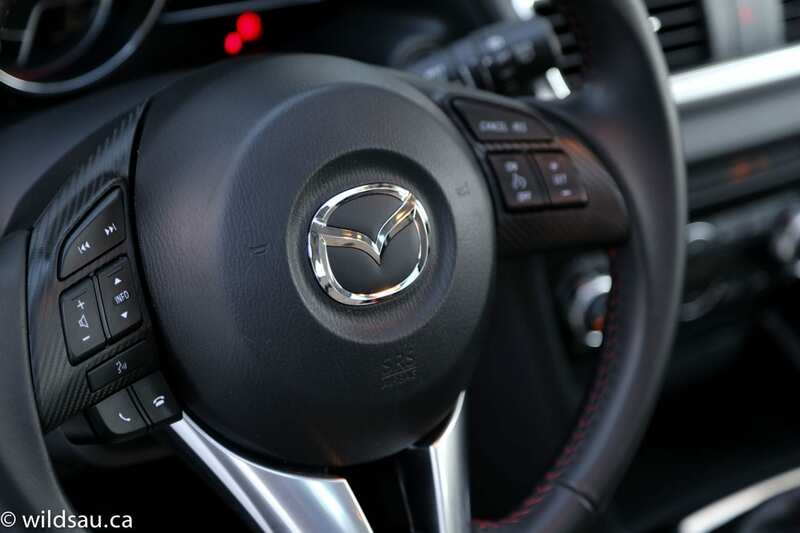 Rather than slapping you across the face with blinding acceleration, the Mazda3 builds momentum with authority and its highly flexible power train is an absolute joy to drive. 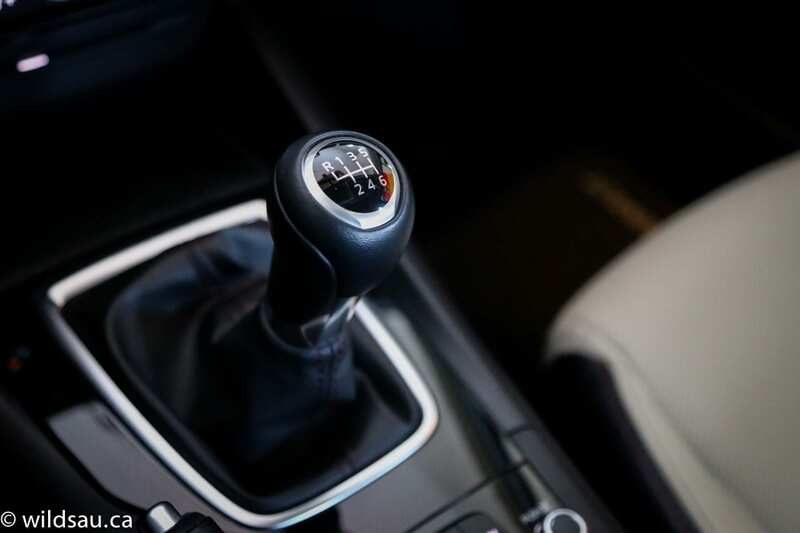 The manual transmission is a pleasure to use. Its short throws are perfect, and clutch take-up is easy and positive, such that you could teach someone to drive stick with it. Occasionally I found the 2-3 shift got a little grumpy, but I learned to get around that. The car’s biggest trump card is its handling. It’s very sure-footed and competent and feels agile in any circumstance. Yet the ride remains civil and comfortable. A very well-balanced suspension to be sure. In addition, Mazda has done a great job keeping the noise levels down, and I was impressed by the car’s quietness on the road. At high speeds there was a bit of road noise, but that was likely the result of the winter tires. Braking is effective and visibility out of the car is decent, although some of the rear and rear-quarter sightlines are hampered by the vehicle’s styling. 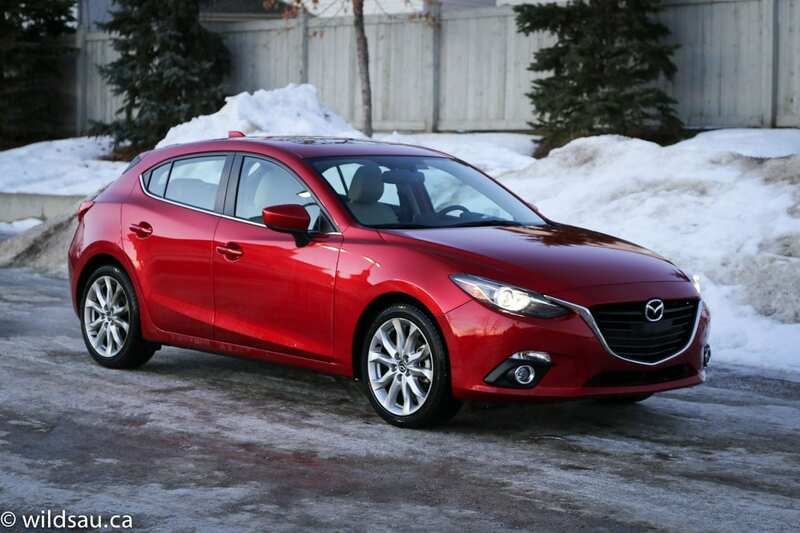 The Mazda3 Sport remains a smart car to buy. It offers a lot, especially in GT trim, and will hold its resale value well. Driving it is a blast, and it returns excellent fuel economy while feeling comfortable and highly refined – more than its reasonable price would suggest. WAF (Wife Acceptance Factor) comes from the passenger perspective as she doesn’t drive manual transmissions. But she does love this car. The styling, the interior and the feels-more-expensive-than-it-is bit all impressed her. She wasn’t happy about the rear seat space, as it’s not quite enough for our family of 5. Obviously I like this car. There’s no question that you ought to put this on your shopping list if you’re buying something in this category. If you end up choosing it, I wouldn’t be surprised. I probably would.